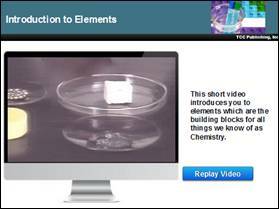 The link below takes you to a comprehensive course on the Basics of Chemistry and is intended to illustrate the full power of Articulate Storyline. If I join your team, what can I do for you? Click here to see the types of assets I can bring to your team. All audio for the course was produced using TextAloud, a Text to Voice tool. The intent is to be able to add audio as quickly as possible during the development and review process so that reviewers can see the various synchronizations with animations and timings. Once edits are made to the audio scripts and scripts are approved, the normal recording using Voice talent would be done. Even though the conversion is not perfect, it gives reviewers a good feel for what the final product will be. Both male and female voices were used for the review part of the process. 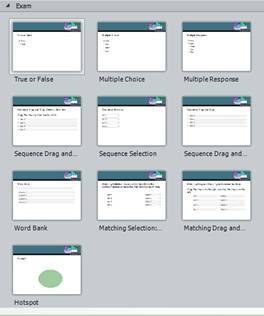 As part of the design and development process, a PowerPoint Storyboard template was created that had all the design elements you now see in the Storyline product. 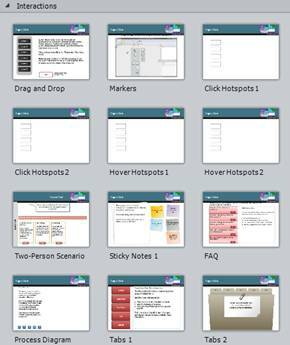 Most of the content including graphics was added to the PPT and then the PPT was imported into Storyline where animations were created, interactions built, audio added and synched with animations along the Timeline, and the questions built. Here you see some of the Master slides in the PPT Storyboard. 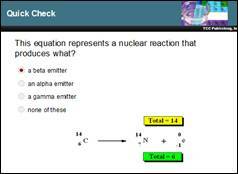 The base graphics were created directly in PowerPoint and relevant images were then added to create the various slide types. 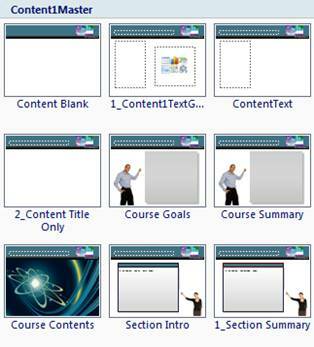 Here you see the Storyboard Starter which has the shell (outline) for the course and several slides that are common to all courses and all sections. 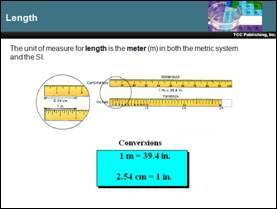 Slides 1-5 will be common to all courses of this type and include: Title, Course Introduction, Navigation Instructions, Course Goal, and Course Contents. 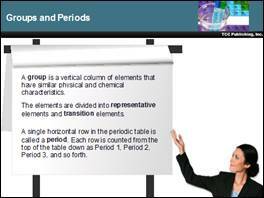 Slides 6-10 represent an outline for one section and include: Section Title, Section Objectives, a Content Placeholder slide, Knowledge Check introduction, and Section Summary. You can see here that is repeated for a total of four sections. 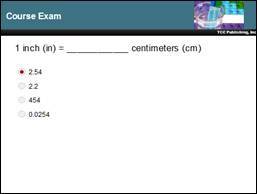 The shell ends with a Course Summary, Course Exam Introduction, and then a Placeholder for the Exam Questions. A Storyline starter was built with the same design elements as in the PowerPoint starter since the Storyboard slides were imported into Storyline and there were some “canned” slides already in the Storyline starter. Here you see the various slides in the Storyline starter. 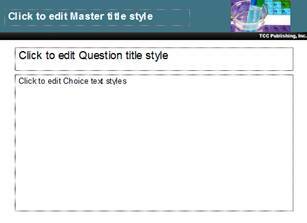 A major feature of the Storyline starter is a Master slide for use in adding questions that matches the design coming in from PowerPoint. 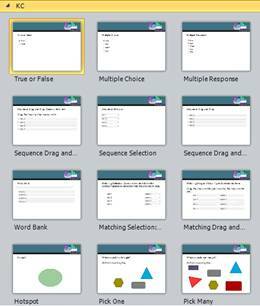 In addition to building the Storyline starter, a separate Template file of useful slides to easily import was built. There were four Categories of pre-built/pre-designed template slides. 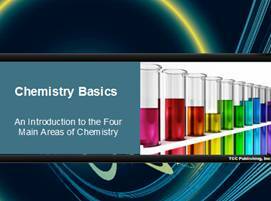 Content: 12 Special Content slide types with several types of display panels. A custom player was created that includes my company logo and colors that match the course design. 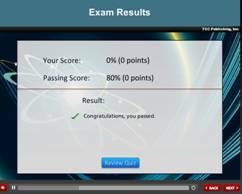 For question slides, the Player is customized to not show the Course Menu or Audio tabs since there is no audio for questions and because I did not want the learner to jump out of a section of questions once they started them (both Knowledge Checks and Course Exam). 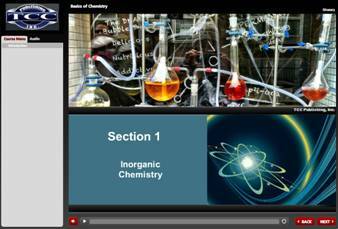 A Course Menu tab allows the learner to quickly jump to any section and any topic in the course. An Audio tab displays the text for the audio for anyone not using headphones or speakers. 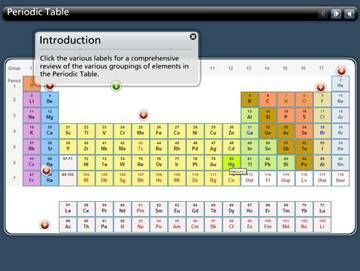 A Glossary button allows quick access to a glossary of terms and definitions in the course. A Resources button allows access to external resources on the web. The module is set up into scenes as shown here. 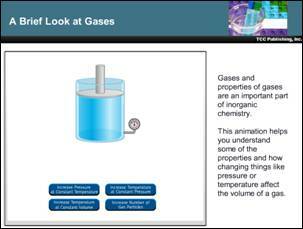 Scenes allow easy organization of the slides. 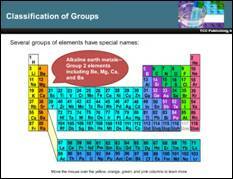 Almost all slides have some combination of text and graphic or graphics. 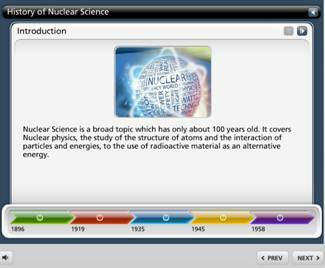 In many instances, text and graphics are displayed along the Timeline as the audio is being played and objects such as the graphics and text are animated in some way (using animations such as Fly In, Grow, or Fade In). Several AVI videos were converted to FLV files and inserted into the module. A Trigger event is used to replay any video. Several Flash movies are inserted using the Web Object. The module contains a variety of different interactions that come from the pre-built interactions in Storyline as well as some that were built from scratch. All use Triggers and Layers to allow for the interactions. 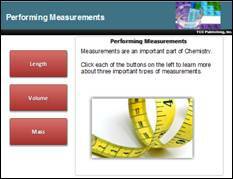 Interaction types include clicks to display more information, mouse-overs, and some drag and drop exercises. Many of these interactions were pre-built and inserted from a template. The module uses some of the characters that come with Storyline such as Atsumi shown here. Likewise it uses some of the display panels like this Flip Chart. 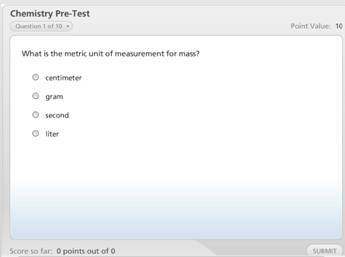 In this example, the learner types the answer to the question and after clicking the Submit button, they see their answer compared to the expected answer. 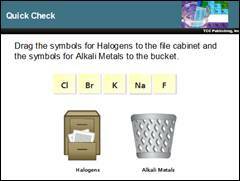 The information typed is stored in a variable and then displayed beside the expected answer. 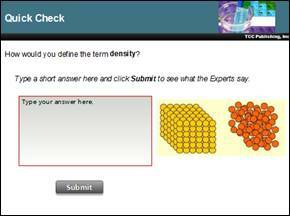 Dispersed throughout each section are Quick Check questions including Short Answer, Drag and Drop, and Multiple Choice. 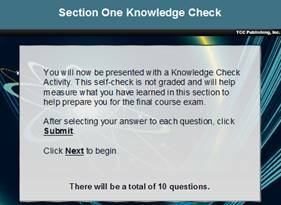 At the end of each of the four sections, there are a series of Knowledge Check Questions that include Multiple Choice, Multiple Response, True/False, and Matching. 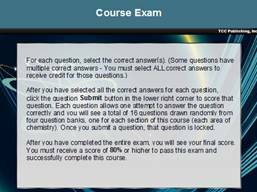 At the end of the module, there’s a scored Course Exam that pulls questions randomly from Question Pools which contain questions from each of the four sections. 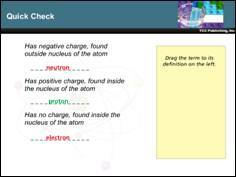 Using the Web Object, a Learning Game was added that was created using the Learning Game feature in Articulate Studio Presenter. 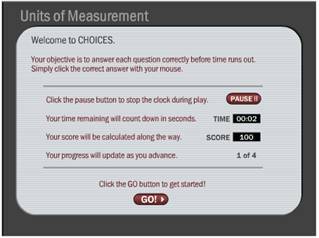 Articulate Studio QuizMaker was used to create a Pre-Test. 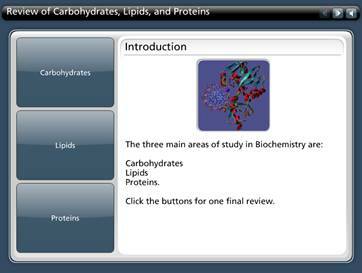 Several Articulate Studio Engage Interactions were created and embedded into the Storyline module.